Consisting of a thin wall shaft repair sleeve and a simple installation tool, SKF Speedi-Sleeve® shaft repair kits can take a worn shaft from scored to restored in less than 5 minutes. 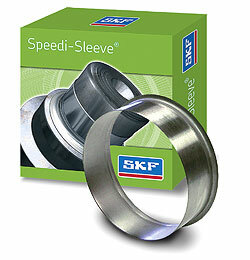 Speedi-Sleeve® installation is possible without having to remove the shaft, and requires no change in seal size. Unlike time-consuming shaft regrinding and refinishing techniques that can produce poor-quality sealing surfaces, Speedi-Sleeve® installation ensures an ideal outer sealing surface every time. Built on a reputation for quality, innovation and value, the SKF Scotseal® wheel seal line offers an optimum sealing solution for a range of maintenance demands. All models feature superior materials and a unitized design to ensure easy installs and longer service life. The most advanced generation Scotseal wheel seal is the preferred choice among many OE truck and trailer manufacturers. The Scotseal PlusXL features an advanced new HNBR (Hydrogenated Nitrile Butadiene Rubber) material that resists wheel end temperatures up to 300º F and offers broad compatibility with synthetic lubricants. Additionally, the Scotseal PlusXL is hand installable, eliminating the need for special size tools. Faulkner Auto Supply sells only the highest quality seals and we rely on CR to supply us with the components that our customers need. Look to us for all of your heavy duty sealing needs. 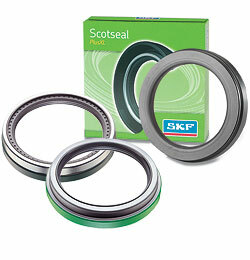 We stock the seals that you need for most trucks and trailers.